As a part of the ongoing effort to get to Fins and Vina’s SPITS party in California, the goal for today was very simple: get the rest of the Great Plains behind me. To avoid another 11:30am wake up (like yesterday), I set an alarm for 9am. The six hours of sleep that I managed to get was the second-best night’s sleep that I’d had over the past week, so I felt mildly refreshed as I started to move around. A part of my Standard Operating Procedure for motorcycle tour mornings is to check the weather radar along the day’s most likely route. Note: You can get radar from any decent weather app for mobile devices, but I like MyRadar because all it does is radar and I can open it by using Siri (I’m an iPhone guy) while I’m riding the bike and see it from the Nightowl’s Navigation module cubby hole, which avoids the need to interact with the device to switch apps and take my eyes off the road. The most likely path for the day was wonderfully devoid of nasty bright-colored blobs that indicated rain (or worse)… except for the small cloudburst taking aim on Des Moines (my current location) in the next five minutes. Fine, I can let that go by while I get ready. By the time the morning necessities were out of the way, the rain had passed and partly sunny skies were drying the droplets that were deposited on the Nightowl. While it wasn’t the 10am start (or better) that I was hoping for, just before 11am was markedly better than yesterday’s 3:30pm departure time. If I was going to get the rest of the Great Plains behind me, I needed to get to Denver, Colorado today. That was over 600 miles (966 km) away, but with good weather, the Nightowl should be able to gobble that up before sunset. Sorry for the hyperbole, but it was damned windy. According to The Weather Channel, we were experiencing steady 30 mph winds with 45 mph gusts. All this on an otherwise nice sunny day. Since I was traveling west and the winds was out of the south-south-west, it was mostly a crosswind with a touch of headwind. From a stability standpoint, the crosswinds weren’t too bad except when a gust takes you by surprise and you have to force your helmeted head to look forward again after being buffeted off to the side. From a mileage standpoint, the impact of the wind was readily quantifiable. When I left the hotel parking lot this morning, my miles-to-empty read 147. After riding 10 miles down the road, that same reading said 109. Do the math, and recognize that this is foreshadowing. When trying to make time, one tends to rationalize how much you can fracture the speed limit laws without drawing unwanted interest from the law enforcement officers in the area. In most states, it is considered safe to travel at up to 10mph over the posted limit. Most people tend to play it save and travel seven to nine mph over the limit. People who are convinced that they are in a hurry (like me) insist on using all 10 mph of that safe zone. If, by strange coincidence, the driver/rider happens to have two methods of measuring their speed, they will naturally choose to gauge their speed based on the method that reports the lowest speed, thus allowing the fastest pace. In my case, that means trusting the GPS over the bike. The GPS regularly shows me traveling two to three mph below what the speedometer reads. My brain rationalizes, “Surely, the high-tech GPS is the more accurate device”, leading me to customarily jack my speed up another two to three mph. It was in this speed-inflated condition that I passed an Iowa State Trooper just east of Council Bluffs. Luckily, there was a truck race (Truck A passes Truck B at Truck_B_Speed + 1) just in front of me, which caused a small pocket of congestion that prevented Herr Officer from merging into traffic until I was almost half-a-mile away. Over the next few hills, I kept an eye in the rear view mirrors for the flashing lights that would indicate that the Officer was clearing traffic out of the way so he could cite the enemy-of-the-state biker that was abusing the speed limit by 10-13mph. I spent some time, waiting for the inevitable, pondering just how many states and provinces had cited me over the past 20 years or so. I’m embarrassed to admit that it’s not a short list. Five miles later and I had yet to see these telltale flashing lights. Right about then, I had to divert my attention forward to negotiate a fairly aggressive pass around the driver of a pickup dragging a utility trailer. This moron had taken left-lane squatting to a whole new level. My usual metaphor for this condition is to say that the driver has “pitched a tent and set up camp” in the left lane. This guy had poured a concrete foundation and evaluating contractors for the main construction for the house he was setting up in the left lane. I managed to dodge around him in the right lane (blessed mother of six-cylinder Teutonic engineering don’t fail me now) before he started his next five minute pass of a single car in the right lane. Just before I80 and I29 merged together, I glanced in my rear view mirror to finally see those flashing blue lights. They were just behind the left-lane squatter as the office escorted this idiot to the shoulder. I was running low on gas but still had plenty to get across the river and into Omaha, which is fortunate given that gasoline is less expensive in Nebraska than in Iowa. Unfortunately, I missed my normal just-passed-the-border exit with convenient gas stations and ventured onward to find another. While leaned over in the turns for the next interchange, I felt the bike hesitate a bit. It took a few quick prayers to half-a-dozen gods to allow me fortuitous last-second access to the next exit ramp, upon which I killed the engine and glided as far as I could. One my momentum was exhausted, a quick consult with the maps app revealed that a gas station was indeed available about 0.9 miles up the road. Keeping the bike as upright as possible, I was able to reach the gas station without having to push the Nightowl in 84º heat. Note to self: When BMW engineers design a miles-to-empty gauge, they don’t build in a safety factor to make the reading conservative. When the gauge reads zero (0), get out your walking shoes. My apologies to citizens and lovers of the fine state of Nebraska, but the scenery in your state, comparatively speaking, is not very exciting. It’s mostly flat and not overly forested. Personally, I do like the ability to tell where towns are by looking long distances to the horizon and searching for water towers and grain elevators. Still, it’s not that riveting, especially if you’re already 250 miles into a day on less-than complete sleep and you’re trying to stay awake. I have my iPhone plugged into the Nightowl’s stereo system via an iPod adapter. The music is then transmitted wirelessly to the Sena 20S headset in my helmet. By selecting music carefully (more Stone Temple Pilots and Big Audio Dynamite and less Air Supply and Enya), you’d be surprised how you can maintain consciousness, even in Nebraska. I stopped for gas, well before the miles-to-empty gauge went down into the single digits, at an exit for Overton. This was not one of the more popular truck stops like Grand Island, Kearney, or North Platte. It was a bit run down and flushing the urinal sprayed water from a cracked supply pipe three feet (1 m) across the room, but they did actually have gasoline, Gatorade, and Pringles. The gasoline was (obviously) for the bike. The other stuff was not for the bike. The temperatures had reached nearly 90º and I had been doing some sweating in my nice black heat-absorbing leathers. The Gatorade was to put back the electrolytes I’d been losing; the Pringles were to replace some of the salt (and provide a modicum of sustenance). During the fill-up, I was entering the gas stop into my vehicle tracking app (RoadTrip) and noticed that Overton, popped up as a previously-visited location. I thought this place looked familiar. That’s one of the things I love about having exhaustive records of everything that happens with my vehicles (and where it happened) going back almost 20 years. It remembers just in case I don’t (which is happening more and more often). As I prepared to venture back down the road, I snapped a few quick photos of the scenery I had available to me. The Nightowl enjoys a rare shady spot during a gas stop near Overton, Nebraska. Does Scenery Know About State Borders? I swear that the scenery in northeastern Colorado knows that you just diverted off I80 and left one of the flatter states in the country. Within two miles of entering Colorado on I76, the landscape ceases it’s table-top profile and starts to undulate. Never-ending farmland gives way to arid grasslands with judicious scatterings of sagebrush. It’s as if the state lines were laid out specifically so entering Colorado meant that the sights could start to get more interesting. Nebraska is, however, deceiving. While I repeatedly accuse it of being flat as a pancake, it is really a long uphill grade from east to west. Notice the elevation increase over this day’s ride from east to west. When you enter the state at Omaha, you’re at approximately 1,218ft above sea level. 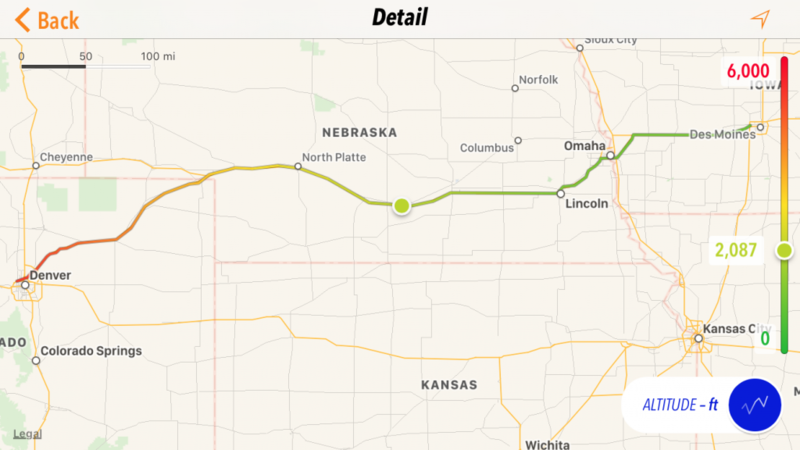 When you leave Nebraska on I76 to enter Colorado, you’re at 3,280ft. That’s over 2,000 feet of altitude increase as you cross the state. You just don’t notice this because the change is spread over 350 miles. After another gas stop in Sterling, Colorado, the sun ducked behind some cloud cover and the late afternoon began to cool down. I closed up the vents in my jacket and wondered if I would have to stop to add a layer before I traversed the last 70 miles or so to Denver. 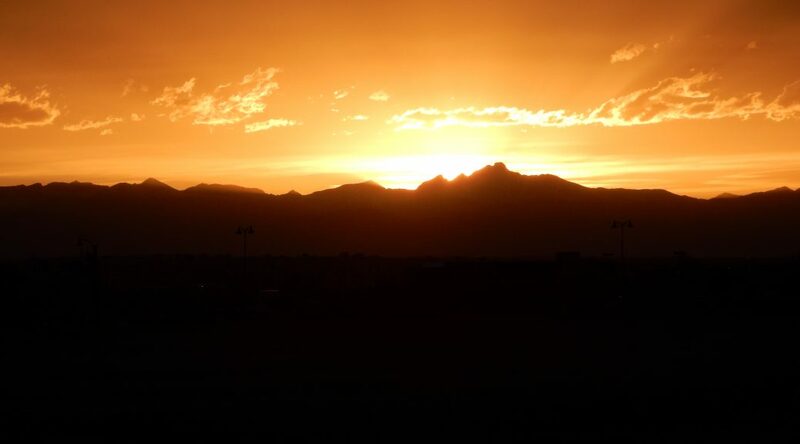 As I approached the outer Denver suburbs, the setting sun found the break in the clouds down near the horizon, just over the distant profile of the mountains. I was chilled and hungry, but the sunset light show that was being put on was just too good to pass up. I pulled over and captured the following imagery. The sun finds that narrow strip of clear sky between the clouds and the mountains as I ride into Denver. At my last gas stop (back in Sterling), I figured I was close enough to Denver that my odds of getting there were fairly high, high enough that reserving a motel room wouldn’t be too risky. I reserved a room at a Super 8 that was towards the western side of the city, which is important if I don’t want to fight late rush hour into the city tomorrow morning. My friends like to use the term notch-above-scuzzy to describe barely acceptable overnight accommodations. This is a notch above notch-above-scuzzy. Having said that, I did have to inform the front desk that whenever the room upstairs drains their bathtub, some of the water finds it’s way through the vent grate in my bathroom ceiling. The rest of the room is fine. I just need an umbrella for when it starts raining in the bathroom. By far the best feature of this hotel, aside from it’s reasonable price, is it’s location 100 feet away from the front door of the local Mexican restaurant. The 3 Agaves Mexican Grill was a godsend. 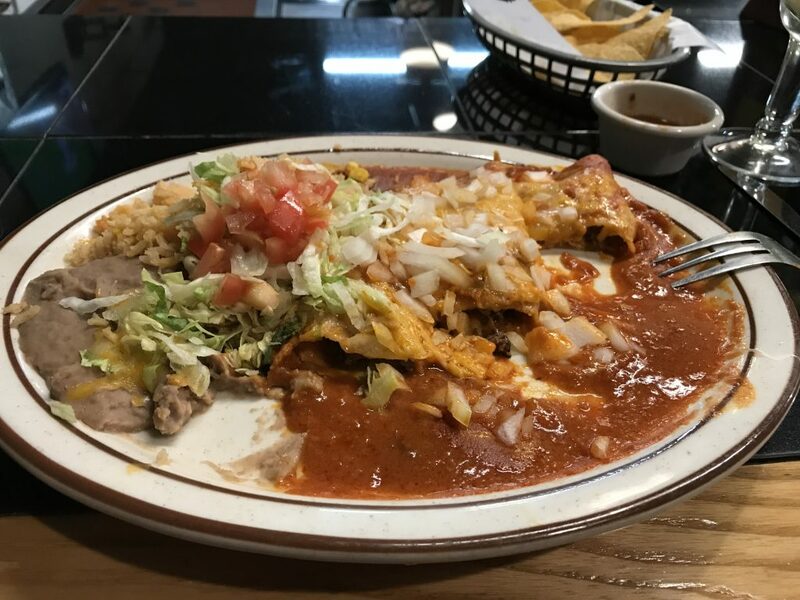 One of the things I absolutely love about the western states in this country: you can’t fall over without hitting at least one excellent Mexican restaurant (sometimes two). Most of them have very basic decor, and 3 Agaves is no different. 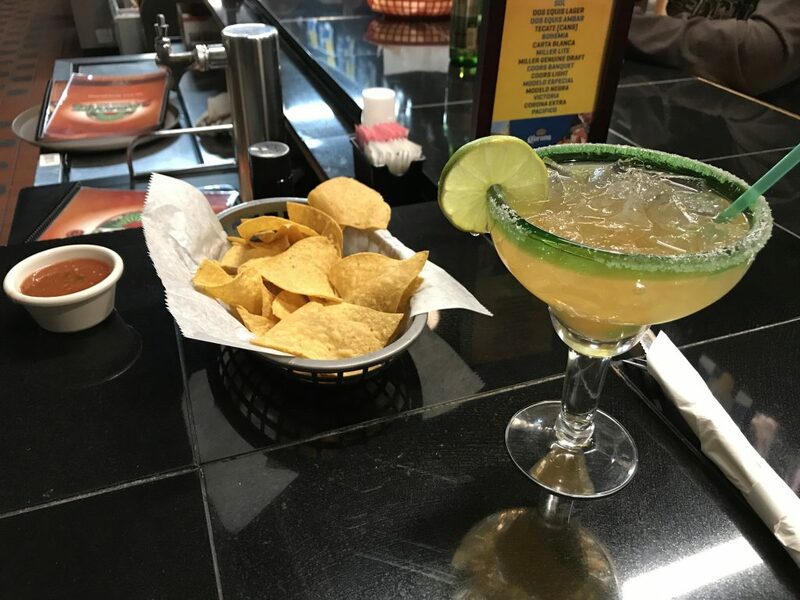 It looks like it was cobbled together from the furnishings and equipment from three other failed restaurants, but the food is authentic Mexican (not Taco Bell) and excellent. Another good sign: I’m the only Caucasian in this place. The rest of the staff and customers are all Hispanic. I had barely sat down and I was greeted with chips and salsa and a invitation to try a margarita. Not a bad start. Proper start to an end-of-day meal. I opted for the steak (not just beef-like mystery meat) enchiladas and followed that up with a dessert of sapodillas. Tomorrow I start through the mountains. I’ll have to take a look at Colorado’s most excellent road conditions site to determine whether Monarch Pass will be open and passable to two-wheeled vehicles.